In 1948, an ambitious 20 year-old Irish journalist with law and law-reporting experience, arrived in Shrewsbury at 9.15 a.m to join a national press agency, tired and hungry after the night boat from Dublin, two trains, and a six hour wait at Crewe Junction. His new boss shook hands in the office at Shoplatch and sent him back up the town to a divorce court. He bought himself a Mars bar for breakfast. After an hour of taking down the most lubricious evidence he had ever heard, about women's underwear draped over a chair, a man in her bed and his shoes under it, the court rose, the clerk sent the bailiff out for a policeman who took him downstairs to a cell. The constable shut the door. The clerk arrived and offered the prisoner a cigarette, declined. He took off his wig and sat down beside him to ask who he was, who he worked for, where did he come from, and when? The reporter replied - Paddy McGarvey, Bryce Thomas Press Agency in Shoplatch, from Dublin, this morning, and the clerk roared with laughter "You are not allowed to write down evidence in divorce; it is illegal. You should have been told that by your editor. You must wait to hear the judge's summary and decision, to report that if you wish" Resuming his wig, he told the police there would be no charge, and to release him. The clerk told the resumed court he comes only this very this morning from a country which forbids divorce, and the court roared with laughter. His meekly polite employer, Leslie Bryce Thomas, arrived and took him back to the office, on this, his first morning, job, court, day, police cell, in England. PADDY McGARVEY'S journalism spans The Southern Star to USA TODAY, and other papers in between - sacked six times. Born in Armagh, Ireland's older Canterbury, the apex of "Bandit Country" for 30 years, he returned three times to work for peace. JAMES PRIOR MP, Secretary of State for Northern Ireland, invited him to his home, telling him: Your scheme is challenging all the constitutional ways of resolving Northern Ireland. The US State Department's PAUL B VAN SON, wrote - his idea would be circulated to all departments involved. EX-PRESIDENT BILL CLINTON wrote a soft put-down hoping McGarvey was on his side. Any student of parliaments is time-wasting for not reading his hilarious account as a Labour candidate in the controversial Mid Ulster seat. The Master of Balliol College, Oxford, now Sir Anthony Kenny, advised him in 1985 not to write only on Anglo-Irish constitutions, because no one will read it. So enjoy the family tale of their spaniel Trilby, lost by a famous Scottish football club, as he moves from journalism, a pioneer facing a hostile Anglo-Irish media. 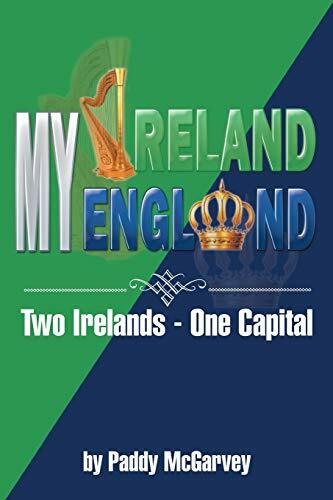 Read how close Ireland came to a single, shared capital, and must do so soon. All she needs is a same-section marriage, with twin beds, in a small Ulster town, in the Republic. PS. It might even work for Israel-Palestine.